Real Alabaster, Turquoise, Coral, Jet, and Feathers. Figurine measures approximately 2-5/8" tall, 1" wide and is 3-1/2" long (front to back). There is nothing at all average about this beautiful figurine! 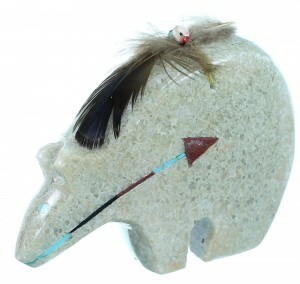 This piece of Native American Pottery is Navajo hand crafted by artist Ben Livingston, out of real Alabaster, Turquoise, Coral, Jet, and Feathers. The Alabaster stone is hand carved into an adorable Bear fetish. 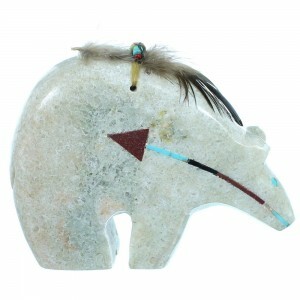 Inlaid Turquoise, Coral, and Jet create the Bear's eyes, along with a striking arrow design. Feathers, Turquoise, and Coral beads highlight for an amazing finish. In Native American beliefs, the bear symbolizes physical strength, leadership, and is known as the "first helper". Arrows usually signify direction of travel, force, and movement.